An unashamedly feminine collection. 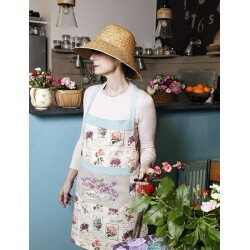 Subtle colours, delicate flowers and polka dots together for a revisited romantic style. Jardin de Bagatelle There are 25 products. 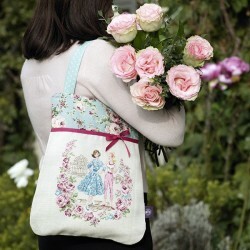 This story is told with 50 embroidery cross stitch designs, small and big patterns ! A garden story is printed on thick paper 160g, 8 pages, with symbols and colors (Ref. DMC).Made in France.To find other stories, please click here ! 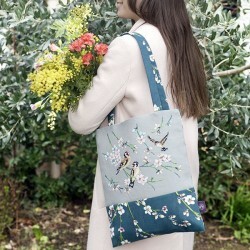 These birds are embroidered as though they were in full flight, scattering delicate cherry blossoms across a bag redolent of spring. You will simply love to take this sober but elegant bag with you whether you are in a contemplative mood walking in the garden or just doing some window shopping. Lily of the valley to wish them happiness, daisies because they are madly in love with each other, forget-me-nots for a simply unforgettable day. 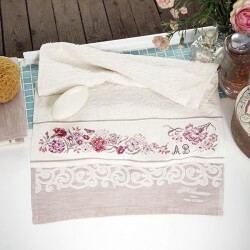 It will take you no more than a day to embroider this delightful flower covered cushion for the happy couple and they will keep it for ever and a day..
You are just going to love wrapping yourself in the soft gentleness of this towel and, as far its embroidery is concerned, you will really appreciate its flowering carnations. 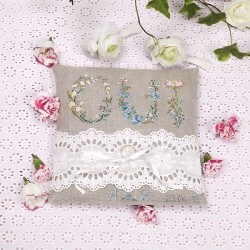 You can offer it as a personalised gift to newlyweds, to your dearest friend or to your darling mother. Fresh as a bunch of roses, joyful as a stroll with good friends as the sun rises above the horizon, here is a bag that will be really in tune with spring ! Its most seductive aspect ? That cheeky pink ribbon right at the centre of a faultless classic : something so terribly French about it … !